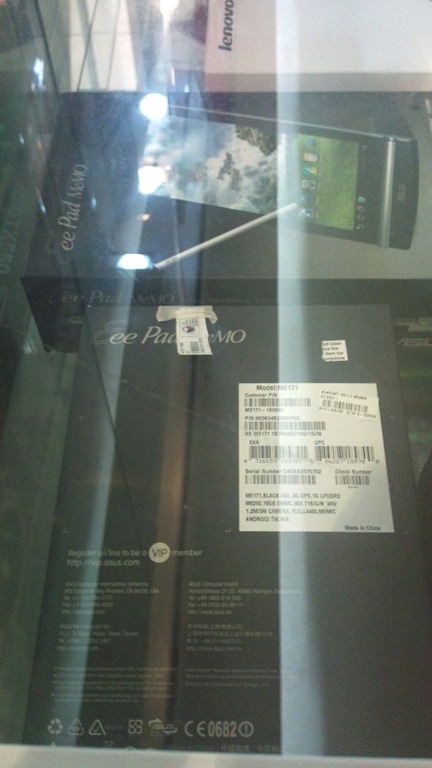 What you see under the glass pane there in this poorly taken photo is the Asus Eee Pad MeMO ME171 being sold at PCExpress in the North Edsa Annex. They have two units on display and it wouldn’t be surprising if those were their only stock at the moment. There is also supposed to be a Tegra 3 version with a different face and code (370T) but that might be overshadowed by the Nexus Tablet altogether. They’re selling it for 19,990 when I asked earlier but there is this ongoing “Great Northern Sale” there right now… let’s just hope that it actually is the retail price. This 7-inch Android device comes with full GSM functionality and a small phone like device called the MeMic which connects to the tablet and shows you messages and transfers the audio as well making it the weapon of choice when making phone calls as opposed to talking into the mic of the MeMO in speakerphone. Important features of note are a 1280×800 Super IPS panel, microHDMI, Snapdragon S3, 1GB RAM, ICS upgrade, 5Mp rear / 1.2Mp front cameras, microSD expansion, GPS, BT, WiFi-N… its practically a slimmed down version of the TF101G. Software enhancements include a BuzzBuddy social networking app, Painter, as well as a dedicated snapshot button which immediately allows pen edits prior to sharing. It really is a complete package as it comes with both a bluetooth audio device and a stylus with an integrated slot in front so you wont lose it. Might be I’ll take one home if and when I sell my TF101, we’ll see. I jest went to PC EXpress. Apparently, the Memic device is not included with the Philippines version of the ASUS Memo 171. Even though it indicates it is on the back of the box. When you open it, it says it is optional on the tablet itself.